Less and More | Ooh, my favorite! Cramped city living constantly has me on the lookout for organization tools and containers that aren’t cheap and plasticy. After all, without much storage space I’ve learned that making everyday things look presentable is the key to maximizing every free space. One of my most shameful examples of organization is my make-up bag. Yes, I have been living out of a small elephant-print make-up bag my brother brought back from Thailand a few years ago. I would have loved to have organized it much sooner, but a hot pink and turquoise Kaboodle is not on my list of acceptable containers; and really, I’m not exaggerating much when I say that Kaboodle-like cases are pretty much all that’s available for make-up organizing. So, needless to say, I’d all but given up the make-up organization until I found the awesome Etsy shop Less & More of Vienna, Austria. Hand-made, sustainable, and eco-friendly, the simple and useful organizing tools here are perfect for my pretty-but-functional criteria. 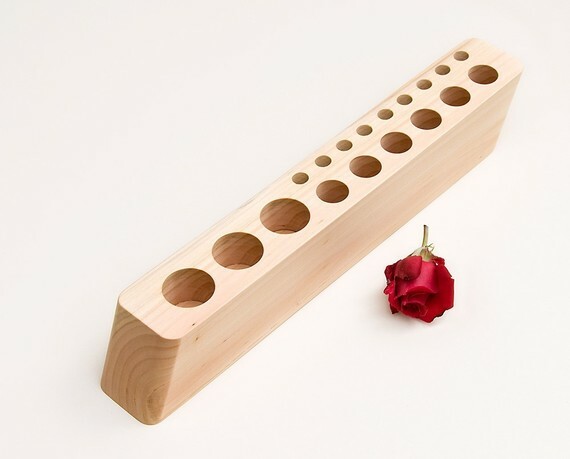 I’m most excited about the Scarlett Make-up Holder; I’ll have to do inventory to make sure it will actually work for me, but the shop overall is awesome. 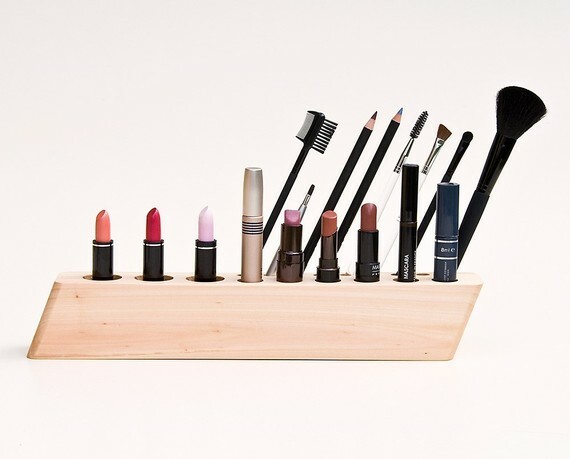 I use some bamboo drawer organizers from The Container Store for storing make up, but your organizer is so much sleeker and chic-er. The Container Store does have some great stuff! But somehow I always get overwhelmed and end up leaving with nothing…even when I have a shopping list with me! The bamboo is a great idea and so much better than the plastic ones.